This pump will provide plenty of air for four to six of the Air Injection Technology Spiders. The air divider has six outlets with two air stop caps, see the photo above, this allows you to provide air to four five or six Spiders or air stones. 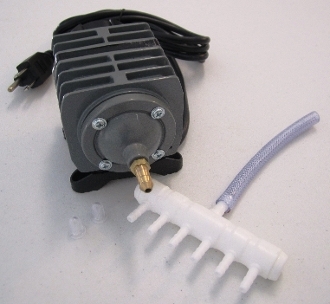 Powerful motor provides reliable air output. 6 outlet air divider for 3/16" ID air tubing with 2 air stop caps (see photo above.) Drive air to: 4, 5, or six Spiders.